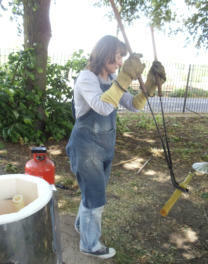 Most of my work is fired by the raku method. Raku is an ancient Japanese method of firing pots. The pieces of work are fired in a kiln in which the temperature rises very rapidly to about one thousand degrees centigrade. While still red hot the pieces are lifted from the kiln with very long tongs and placed into a bed of combustible material such as sawdust. The rapid cooling of the glaze when the pot is taken from the kiln causes the crazed effect in the glaze. The sawdust starves the pot of oxygen creating lustre effects in some glazes and turning the bare clay black. When they are taken from the sawdust some time later they are completely black and it isn’t until they are washed that the true colours are revealed. Because of the crazing of the glaze and the relatively low firing temperature the pieces are not food safe. They are works of art and purely decorative.